Here is the preliminary report about the collision between the two aircraft. Due to several hacking, the Ministry of Transport and Infrastructure ( and others Kenyans websites) were several times closed. That why, the report is available for consultation, since only some weeks. "The Rwandair B737 aircraft had taken off from Kigali International Airport,Rwanda and landed at Jomo Kenyatta International Airport, Kenya uneventfully. The aircraft was directed to park at Bay 15, a change from their original allocation of Bay 14. 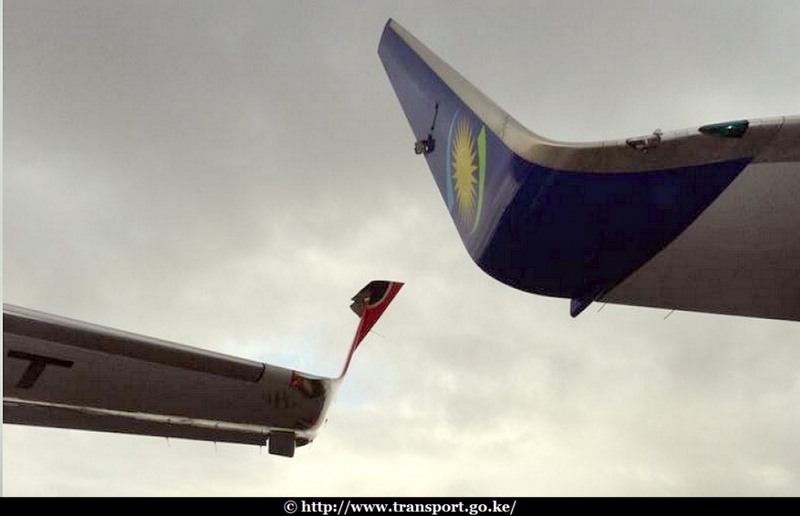 While taxiing into the designated parking bay, right hand winglet made contact with the left hand winglet of a Kenya Airways Embraer 190 aircraft parked on adjacent parking bay. 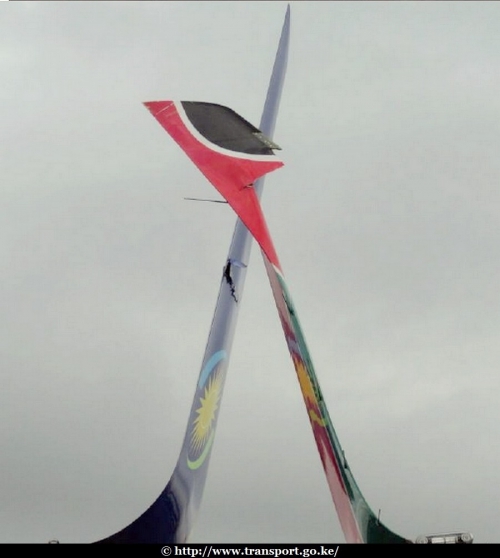 There were minor damages on both winglets of the two aircraft"
The B737-700 which hit a Kenya Airways ERJ-190, 12 days ago is now at Kigali. According to lihomeradar, the aircraft left Nairobi, this morning with the flight number RWD401X. On 3 may 2013 ,a RwandAir B737-700 which was taxiing hit a Kenya Airways aircraft, at Nairobi Airport. No injuries among passengers. It seems that the aircraft have not been moved, since 4 May. No callsign, no flightnumber (aircraft moved to the Kenya Airways maintenance). Flights Nairobi Kigali and Kigali Mombasa Dubai were affected during about three days. We have contacted both a guy working at Nairobi Airport and the Kenya Airport Authority, they confirmed us the incident. We will have more infos later, mainly about the damages. Good Morning @RwandAnFlyer, we are confirming the same with our GFS team. we will get back to you when we have the details. .Tariq L. yah Rwandairs 737-7 hit one of KQs aircraft while taxiing. A Selex Falco Drone crashes in DR Congo. Similiar stories in Wales and Pakistan ?